Cynthia Moss, Amboseli Elephant Research Foundation, Kenya. "In 1988, while visiting sweden in conjunction with the launching of my new book Elephant Memories, I had the plesaure of meeting the two elephants at Skansen Zoo along with their keeper Dan Koehl. I was very impressed with the situation that existed then. It struck me that the two elephants were among the best-cared-for and happiest I had ever seen in captivity. They were well disciplined but at the same time unafraid of Dan. The three of them appeared to have a strong and sweet rapport." Cynthia Moss Amboseli Elephant Research Foundation , Nairobi, Kenya. "When we just before the summer season had a staff vacancy in our elephanthouse, we hesitated to internally recruit among our zookeepers, since they are inexperienced with elephants. Our elephant management concept is built on the basis of activework, (free contact/hands-on) and socializing between handlers and elephants. When we decided to fill our vacancy, we thought a lot about the safety aspects, both for the animals and trainers, and how important it was to expand our present staff with anexperienced person who immediately could get involved in the elephants daily care and training, and we found a suitablesolution when we hired Mr. Koehl. He has in a competent way been able to work actively with our elephants from the first day, and was with his flexible attitude quickly integrated with the rest of the staff. We can warmly recommend this solution for zoos that suddenly have temporary needs to increase their elephant staff at high-season and vacations." "Mr Koehl was repeatedly contacted by the management of Schoenbrunns Zoo over the telephone on questions of elephant management during the winter of 1997/98,and was employed by Schoenbrunn Zoo, Vienna, from February 24, 1998 until November 30, 1998. 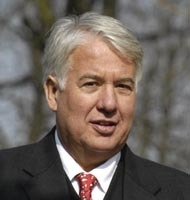 Upon Mr Koehls wish, the employment was only a temporary one. By reasons of personell problems, Schoenbrunn Zoo was forced to form a new team of elephant keepers.It was Mr Koehls task to deepen their state of knowledge and to build a up a harmonic relation between the keepers and the elephants (originally one bull and four cows, in August 1998, one female elephant was added to the group).Mr Koehl soon won our elephants confidence and cared for the protected contact training of Pambo, our young bull, with great sensitivity and impressive success. Early after Mr Koehls arrival in Vienna, Schoenbrunns Zoo was faced with an agressive campaign concearning its keeping of elephants, Mr Koehl proved to be a loyal and diligent employee,also in his contacts with the media and the general public. 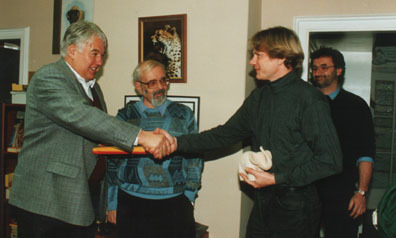 From left: Director Dr Helmut Pechlaner, Curator Dr Kurt Kolar, and Dan Koehl. Mr Koehls activities contributed to the formation of our team of well-trained elephant keepers which is now in charge of the harmonic group of elephants at Schoenbrunn Zoo. We herewith thank Mr Dan Koehl for his personal efforts which were far beyond average, we express our respect for his expertise and wish him the best for his future." When I asked you for help we had a difficult situation caused by several factors: The growing selfconfidence of "Gustl" which resulted in attacks upon keepers, the building of the new house in the immediated vicinity of the old one - and that resulted in unavoidable additional stress in elephants as well as keepers.New keepers had to be inroduced into the existing crew and two new elephants arrived.Last but not least oo Dresden was heavily attacked by members of animal rights organisations in a quasi terroristical attitude.In that situation expert help from the outside was essential and I am glad to confirm, that the efforts of Zoo Dresden plus your efforts in working together with the elephants and the crew had remarkable effects. It was more important, that you could help directly in working daily with the keepers and elephants, whereas my curators and myself sorted out the other problems. After the final good results keepers and elephants settled down and we are now back to normal. Once again many thanks for your help: It was essential and you ended up with the best results." Angela Mair, Zoo Walding, Mursberg, Upper Austria. "Mr Dan Köhl worked from 17 september 2001 to 15 May 2002 in my Zoo as elephant trainer and -keeper for my 2 asian elephant cows. he had the fully responsibility for the animals, and since I had to spend a longer time in hospital. During this time the two elephants had to undergo ultrasound examination in the uterus, why Koehl suddenly had to train the elephants for this on a very short notice. Mr Dan Köhl was competent and also took care of the elephant feet to fully satisfaction. I wish him all the best for his future."